...Circa 1951 twelve French designers created one of a kind dresses for Toni Several were gowns. Though the clothing may have been exquisite...I still have a hard time envisioning Toni in an adult fashion. 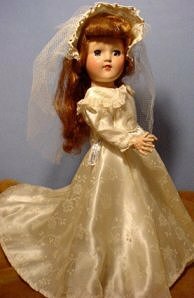 Toni as a bride was understandable as young girls of the '40s and 50's era dreamt of becoming a bride one day. The designers of the Paris fashions were "Pacquin, Rochas, Piquet, Rouff, Lafaurie, Carven, Bruyere, Gres, Patou, Rochas, Heim, Worth and Dresses". These creations of Toni doll clothing were presented at an "exhibition held at Gimbel Brother's Department Store". Personally, I have never seen any of the dolls in the fashions mentioned prior and only quote from various references in published books regarding Toni. 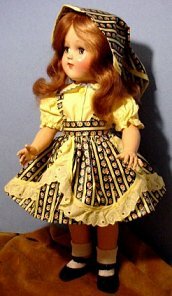 The average final eBay auction price for an original Toni dress may run upwards from $35.00 (depending upon condition) and generally around $50.00, some much higher. Suitable and very appealing dresses and clothing for Toni can be purchased in the $10.00 range. 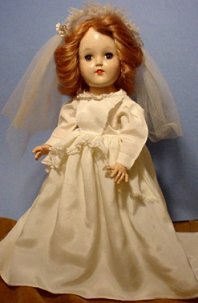 You just need to come to the computer with the measurements of dress required...and shop until you find the outfit or garment that is perfect for your own doll. Just like shopping for back-to-school clothing! 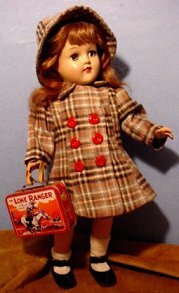 Although I have spent many years searching for Toni doll clothing, to replace newer clothing on dolls and just trying to restore a doll's apparel to the correct vintage era, the success I have had during the last five years has far surpassed any I had prior. 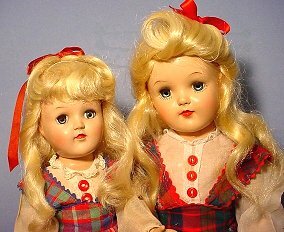 When my husband introduced me to eBay, at first, I was fascinated by the number of dolls that were offered on a continual basis. 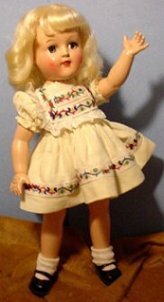 The internet had opened a 24 hour...seven day a week doll show that was irresistible. 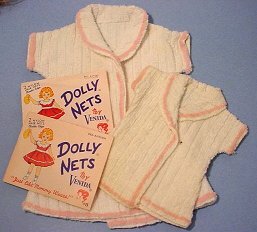 It was only by accident that I discovered the category listing vintage doll clothing, furniture, and accessories. 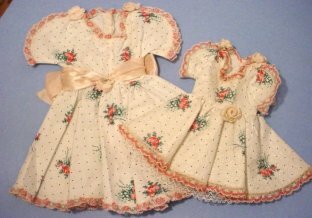 Through the years there had been an excessive amount of doll clothing accumulating in this household. 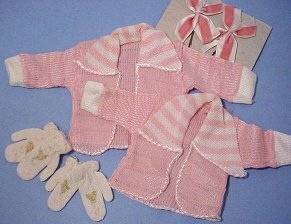 Some were pieces of an identified outfit for a particular doll, some were suitable for orphans that were just passing through to new homes, and some were not even the size needed for the baby dolls of my personal collection. Through my husbands tedious work, photographing and listing the excess on eBay, the immense pile started to diminish. I was still too computer illiterate to maneuver the listing procedure...but I had become a whiz at shopping! 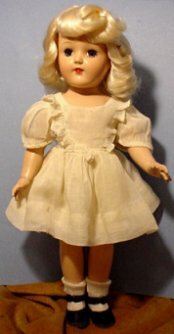 Due only to the access of on line shopping, I have been able to purchase the missing items needed to complete a dolls outfit and down size the pile of unnecessary, incomplete clothing that had been hoarded for nearly 20 years. 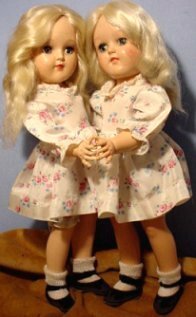 Shopping for Toni doll clothing for the "twins" or "big and little sister" is a very rewarding challenge. 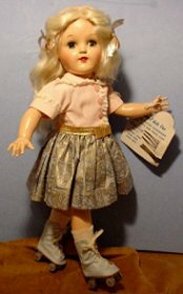 Since the auctions on eBay provide offerings worldwide, many "old store stock items" of Toni doll clothing which surface occasionally, have been made available to the many collectors shopping online instead of being restricted to the seller's neighboring shows and sales. 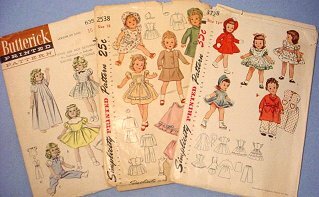 Some of the vintage Toni doll clothing may be original to other dolls of that era, some may be old stock with original paper labels boasting a 25 cent price still attached. The enjoyment has been acquiring the accessories in two different sizes. Sometimes identical. Sometimes a variance of color. 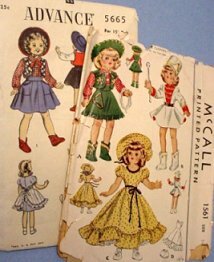 For those of you that have the creative ability to design and sew, many patterns of Toni doll clothing from the late 1940s and '50s are also available to purchase on eBay. 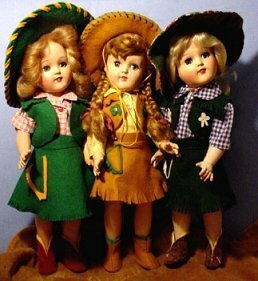 My favorite pattern is that used to fashion the felt cowgirl outfits. Although the felt available today is not the same heavier material found in the completed early outfits, when assembled the ensemble is still quite striking.